One night last week, I wasn't so jazzed about what I had planned for dinner that night. Short on time, I decided to defrost some cod from the freezer, and I stood in front of the pantry looking for inspiration. I spotted chickpeas and sun-dried tomatoes, and had a stoke of brilliance as I decided to make a Mediterranean version of this Foil-Baked Fish with Black Beans and Corn. I started by roasting some grape tomatoes and garlic in the oven. I then mixed them with chickpeas, lemon juice, red onion, parsley, oregano, and feta. The fish was slathered in a compound butter with sun-dried tomatoes, lemon zest, and garlic. As the fish cooks, the butter melts into the fish and leaves it moist and flavorful. The combination of roasted chickpeas, tomatoes, and feta is truly wonderful - it was definitely the highlight of the meal. This meal is easy, super delicious, healthy, and ready in well under an hour. Those are all things that I look for in a weeknight meal, how about you? Preheat the oven to 400 degrees and line a baking sheet with foil. Toss the tomatoes and garlic cloves with 2 teaspoon of olive oil, 1/4 teaspoon of salt, 1/8 teaspoon of pepper, and the sugar. Roast, stirring halfway through, about 15 minutes. Meanwhile, pat the fish dry and season with salt and pepper. In a small bowl, use a fork to mash together the butter, sundried tomatoes, one of the garlic cloves, lemon zest, 1/2 teaspoon of salt, and 1/4 teaspoon of pepper. Spread the mixture over the top of the fish filets. In a medium bowl, toss together the chickpeas, tomatoes, onion, feta, oregano, lemon juice, 1/2 teaspoon of salt, 1/4 teaspoon of pepper, and most of the parsley. Arrange the packets in a single layer on a rimmed baking sheet and bake until the fish is just cooked through, 15 to 20 minutes. Carefully open the packets and sprinkle with remaining parsley. Serve. 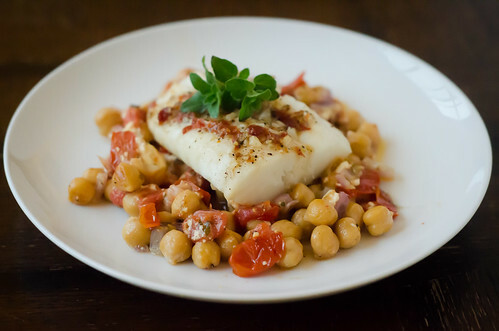 Chickpea's and fish... I love it!!!!! I had *hoped* for olives. But, chickpeas? Even better! This looks so good, girl. Can't wait to try it! I'm thinking mahi or halibut. Oooh, I love this! It's just about to be that time of year when I eat more fish than I can handle and this looks like an awesome variation to keep things interesting! 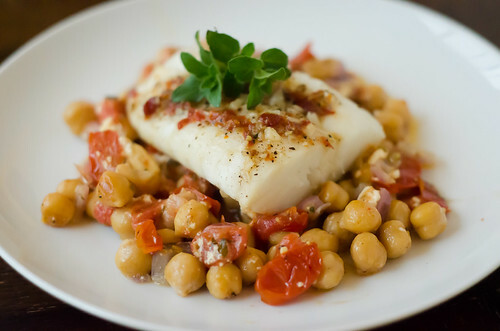 Foil-baked fish with these fresh delicious ingredients is a surefire way to a delicious meal! Perfect, perfect. I'm making your portobello lasagna tonight, this will be on the list for the weekend! Looks amazing! An super easy. I'd love to try this recipe out sometime.